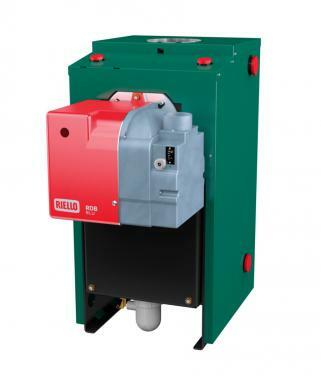 The Enviroblue Popular 35kW Boilerhouse Regular oil boiler is a highly reliable condensing, floor-standing unit that has been designed and manufactured by Firebird. To minimise heat loss, the Enviroblue has a fully insulated casing, increasing efficiency. As a Boilerhouse Regular boiler, it can be housed in a Boilerhouse garage or outbuilding, allowing you to save that much-needed space in your home. As a Regular boiler, also known as a Heat-Only or Conventional boiler, it heats your central heating system directly as well as producing hot water for your cylinder. Regular boilers require a cylinder, often fed by a cold water storage cistern located in the attic, meaning that this type is not suitable for smaller properties or homes where space is limited. This is a highly efficient oil boiler, shown by its seasonal efficiency rating of 93% and ErP A rating for heat. A 35kW output rating makes this boiler perfect for larger homes that have more than one bathroom and a high demand for heating and hot water. For homes that don’t have such a high heating and hot water demand, there are two other outputs available in the range: 20kW and 26kW. You can be sure that no matter the size of your home, there will be a boiler in this range to suit the demands of your home. This reliable oil boiler comes with a wide range of features that will benefit your home, such as blue and yellow flame options, premium steel, fully insulated casing to minimise heat loss, a PCB controller, anti-cycling function and multiple tapping points for ease of installation. As well as all of this, the Enviroblue has a patented heat exchanger, multi-directional flue options for flexibility in where it can be installed and a high performance MHG / riello RDB blue burner that is complete with full diagnostic control box. Featuring a 2 year warranty, you’ll be protected well after installation has taken place.